My daughter received this dress for her birthday, and although it was adorable on the hanger, the design just wouldn't do. Unfortunately, because the arm holes were cut at such an angle, our lil' lady was finding herself rather exposed on top. This dress was absolutely not going to be suitable for public wear, so I had to come up with a way to work with what I had. Original dress- note extreme angle cut for arms that caused major "wardrobe malfunctions" when being worn. I tried to shorten the straps but found that I just couldn't work with that intense angle. I even toyed with the notion of making the dress a halter but again found that it didn't cover my daughter's top amply. Soon, I realized I'd have to scrap the top of the dress altogether and try to create a skirt with the remaining pieces. First, I used fabric scissors to remove the top banding around the neckline so that I could reuse it to go around the waist of the skirt. Next, using the fabric scissors, I carefully separated the top section of the dress from the skirt portion. Then, I used safety pins to connect the original neckline of the dress to the top of the detached skirt. I simply sewed it on to create a cute new look! Voila! We're so glad we didn't have to turn this cute dress into a dust rag, but we just couldn't use it as it was. Now we have a fully functional, adorable new skirt that our daughter can wear without being overexposed! 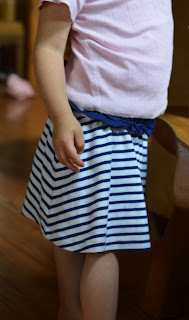 This was a very simple and successful alteration, and my daughter is much happier and more comfortable now in her soft new skirt. The solution presents itself! Finished result- comfy new skirt!